Distracted driving takes many forms on Pennsylvania roads, but it is always dangerous and can lead to serious motor vehicle accidents. Any action which may take a driver’s attention from the road including cell phone usage, applying makeup, eating, drinking, and socializing can be considered distracted driving. Hundreds of thousands of people are injured each year in the US as a result of distracted drivers. If you or a loved one has been the victim of a motor vehicle accident caused by distracted driving, the personal injury attorneys of Kamensky, Cohen & Riechelson may be able to help. We have over 45 years of experience successfully resolving personal injury claims for clients in Pennsylvania across towns like Northeast Philadelphia, Levittown, Bensalem, Feasterville, Penndel, Millbrook and all of Bucks County. For our clients who have been injured as a result of distracted driving, the odds are favorable that they will be granted full and fair compensation for medical expenses, missed work, pain and suffering, and more. Call our office today to speak with a member of our personal injury claims legal team in a free and confidential consultation to discuss your individual needs and concerns surrounding an injury sustained as a result of distracted driving. In Pennsyvlania, it is strictly forbidden to text and drive. This ban includes use of any “interactive wireless communication devices” to send, write, or read any type of text-based communications such as instant messages, text messages, emails, and internet browsing. Unfortunately, many drivers choose to recklessly ignore this regulation and use their mobile devices for functions other than phone calls while operating vehicles. As of the writing of this page, there are no explicit Pennsylvania regulations regarding distracted driving beyond the ban on texting. Bills to prohibit hand-held mobile phone use while driving have been introduced as recently as July of 2017, but so far none have become law. Therefore, while distracted driving is akin to driving while intoxicated in terms of assumption of liability, it can be more difficult to prove. In the case of a driver being distracted by mobile phone usage, our Northeast Philadelphia attorneys will work to uncover phone records which may be the proverbial smoking gun in your case. Often times witness testimony or written police reports are a great way of showing that the other driver was in fact distracted. Beyond phone records, police reports, and witness testimony, we may be fortunate enough to catch the other driver in the act of driving while distracted on traffic cameras. Particularly in the Northeast Philadelphia area, the prevalence of such cameras can be great for collecting evidence. Accidents caused by distracted drivers can often lead to successful personal injury verdicts or settlements. However, there are certain actions which can help and others which can hinder your claim. 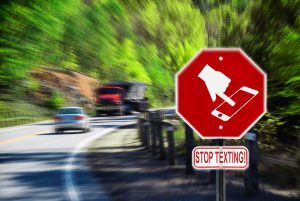 The following is a list of do’s and do not’s which we suggest to our clients injured in a motor vehicle accident caused by distracted driving. Do seek medical attention – seeing a doctor as soon as possible is a great way to not only receive the necessary medical treatment for you injuries, but also to receive diagnoses which may be critical to your personal injury claim. The sooner you are able to see your doctor, the stronger the connection between your diagnoses and the accident caused by distracted driving. Do not sign any paperwork before speaking with a lawyer – this is true of any legal paperwork. Insurance companies will attempt to settle claims as quickly and cheaply as possible. This often entails offering low, one time settlements while waiving the claimant’s rights to future compensation. Do exchange information with other driver(s) – even if you are upset, it is important to exchange information with the other parties involved if possible. If you or other parties are too injured to do so, safety should remain the number one priority. Do not admit fault to other driver, police or insurance company – many of us feel a pang of guilt when involved in an accident even if it was due to the actions of another. Do not say anything which could be construed as an admission of fault to anyone before speaking with your attorney. Do speak with an experience personal injury attorney – To give yourself the best chance at a successful outcome, working with an experienced attorney is a vital step. Distracted driving is an act of negligence which is a concrete cause to find drivers liable for a motor vehicle accident resulting in injury. If you or a loved one has been injured in an accident resulting from another party driving while distracted, our Bensalem personal injury attorneys will likely be able to build a strong personal injury claim. At Kamensky, Cohen, & Riechelson, our attorneys have been successfully resolving personal injury claims for clients in Pennsylvania towns including Northeast Philadelphia, Levittown, Millbrook, Bensalem, Feasterville, Penndel, and the greater Bucks County region since 1972. Lean on our experience to recover compensation you need and deserve for injuries resulting from a distracted driving accident. Contact us online or over the phone by calling our Bensalem offices at (215) 337-4915 for a free and confidential consultation today. A member of our personal injury claims team will be standing by to learn more about your individual needs and concerns as they pertain to you injuries sustained in a distracted driving accident.